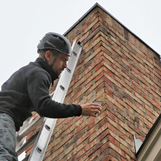 Chimney Solutions provides chimney sweep services like chimney repairs, chimney restoration, tuckpointing, masonry rebuilding, firebox restoration, and even chimney leak repair for residents in Woodstock GA. Since 1998, we have been serving residents in the Greater Atlanta area, including Buford, Dawsonville, Acworth, Smyrna, Buckhead, and more, with quality chimney services. Is it time to service your chimney or fireplace? If so, trust in the pros of Chimney Solutions. We employ only the best CSIA trained & certified chimney technicians to ensure that every job performed by our company is completed to the highest quality of workmanship. 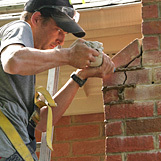 We’ve become the go-to chimney contractor for Woodstock GA and the surrounding communities. We stand behind every job we complete and our focus is on customer satisfaction and safety which is why we receive tremendous amounts of word-of-mouth referrals. Find out why your friends, family, and neighbors choose Chimney Solutions for all of their chimney & venting needs. From Olde Rope Mill Park down Interstate 575 to Woodstock Square, across Highway 92 to Gordy Lake, you can spot our chimney sweeps traveling on their way to service chimneys throughout Woodstock. Our brightly marked company vehicles travel across Arnold Mill Rd and up & down Main Street regularly, so make sure you wave as we travel by! From chimney cleaning to chimney relining, and historic chimney restorations to chimney rain pans & shrouds, our chimney techs work tirelessly to ensure that the residents of Woodstock have safe & efficient chimney & venting systems. All of our techs are certified & trained by the CSIA and we will always arrive on time, in company uniform, and in a clearly marked company truck. Our company is fully insured to work on your property and in your home, and our sweeps are highly-skilled to handle even the most complicated chimney issues. Residents have come to expect quick response, fair estimates, and a full explanation of recommended services every time they work with us. We complete every job in a timely manner and will always keep your space clean & orderly. We are good standing members of the National Chimney Sweep Guild and the Chimney Safety Institute of America so we can stay on top of industry standards, best practices, and new products. Consumers beware! 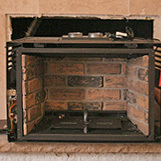 Watch out for fake “chimney contractors” who scam unsuspecting homeowners. By promising prices that are too-good-to-be-true, these unsavory companies attempt to lure homeowners into hiring them for common chimney services. But this is not their ultimate goal. Once they have been hired for the job, they will arrive to perform a “cursory” inspection before they begin any work. They will then report to the homeowner that there is serious damage or repairs that require immediate attention. Don’t say “yes” to any expensive chimney services without getting a second opinion from a reputable chimney sweep first! In most cases, these repairs are neither required or necessary but since most homeowners don’t know the current condition of their chimney, they scammers use this to their advantage in an attempt to upsell homeowners. A properly working chimney is necessary for the safety & efficiency of your venting system. Don’t trust this work to just anyone! . We assist residents of Woodstock GA with maintaining their chimney, fireplace, stove, or fireplace insert and venting system. If you want the chimney sweep service you deserve at a fair & honest price, trust in the professionals at Chimney Solutions.